“Looking at the earth from afar you realise it is too small for conflict and just big enough for cooperation.” – Yuri Gagarin. As the early rays of sunlight slowly bled across the horizon, Yuri Gagarin clambered into the spherical capsule spanning 2.3m in diameter1 – the Vostok 1. He would call this home for the next 108 minutes1. At 6:07 UTC, April 12, 1961, the cosmonaut launched into orbit from the Baikonur Cosmodrome launchpad. He made one orbit around the Earth at an altitude of 327km above sea level. After 89 minutes in orbit at speeds of 27,400km/hr2, the spacecraft corrected its orientation for re-entry. As the one-man vehicle hurtled toward the ground, Yuri experienced forces 8 times that of gravity, but remained conscious enough to eject 7km3 above ground. As Vostok 1 made fiery contact with the ground, Yuri gently cascaded and landed in a dazed, safe and in a state near the town of Engels; thus, marking the first human space flight. 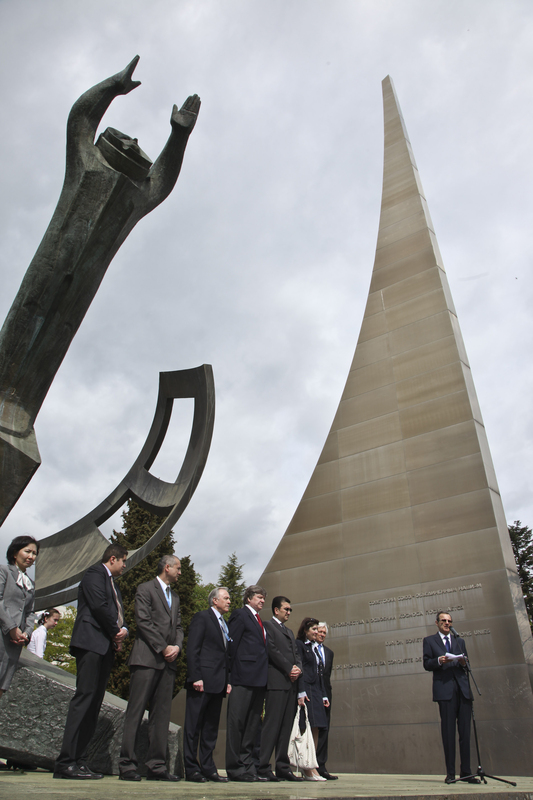 Wreath laying ceremony for the 50th anniversary of the first flight by cosmonaut Yuri Gagarin held at the Monument to the Explorers of Space (gift of the former USSR) in the Ariana Park, UN office at Geneva, 12th April 2011. Every year we commemorate the accomplishment born from the Cold War rivalry, and every year we remember how the Space Race brought unto civilisation the fastest growing technology witnessed in its time. We recognise these feats not for the conflict for which allowed this progression, but for the limitless possibilities mankind can achieve by transcending unnecessary dissension. Further, we seek to establish fundamental principles in the conquest to better understand our universe. Cornerstones which ensure that in our time, and those to come, space exploration is synonymous with cooperation, accord, and unison. For if Neil Armstrong took one giant leap for mankind, then Yuri taught mankind how to leap.